Over the years many people have interviewed Connemara politicians but purely in a political context; there was no emphasis on trying to establish the true identity of the person/s behind the politics. When many people interact with politicians they see them as tools of access to solving a problem, not reflecting that they also have private family lives. This audio presentation gives each family representative an opportunity to deliver a rare insight into the intricacy of the family behind the public perception. 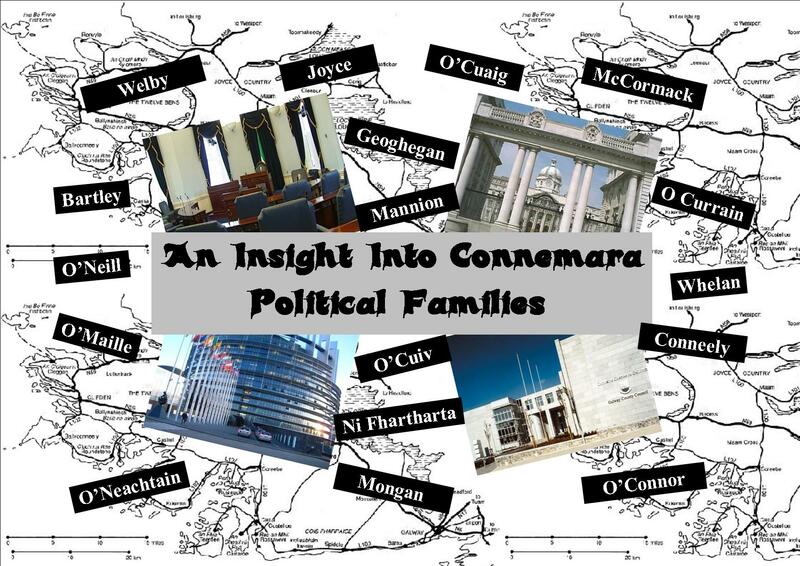 The families currently selected represent a spectrum of the overall political representation in Connemara since the foundation of the state. It also enables the family presenter to focus in an apolitical way. For example when politicians or their ghost writers deliver a book, in many cases it deliberately places an emphasis on controversy to help promote the book sales. However the main emphasis on this presentation is to capture in audio mode, political families for posterity. This will benefit researchers in many facets, especially in giving a cultural/historical dimension in addition to the political. It is well documented that the Connemara Diaspora also played a part in political life in other countries worldwide. In many instances it is difficult to trace, especially from the past because of their reluctance to acknowledge their family ties to Ireland. The famous Australian politician, King O’Malley in all probability is an example. However the changing culture is evident; Marty Walsh is an example, the current mayor of Boston, is proud of his Carna/Rosmuck/Connemara connections. Martin O’Malley former Governor of Maryland is another example. Here is the list of the Connemara families included in the presentation and the tracks they are available on. The presentation will commence with the audio introduction by Colleen Curran (track Politics – 1000 Colleen Curran). Track 1001, deals with a segment of the Joyce family delivered by PK Joyce. Track 1002, gives an insight into the Welby family presented by Thomas Welby. Track 1006, relates to the Mongan/McDonagh/Mylotte families and is presented by Eamon Mylotte. Track 1007, Josie Conneely gives his county council experience of success and failure. Track 1008, gives an insight into the Bartley family with a focus on former government minister Gerald and his nephew Gerald, this is delivered by Richard Bartley. Track 1009, Seosamh O’Cuaig focuses on people power politics. Track, 1010, PK Joyce gives a indepth history of the first Sinn Fein TD for Connemara – Padraic O’Maille. Track 1011, former councillor/senator Nicholas O’Connor casts a glance at the O’Connor politics. Track 1012, Thomas O Currain gives his memories/opinions of his political life. Track 1013, Thomas Whelan gives an insight to the politics of his uncle Thomas Whelan who was executed during the War of Independence. This also includes the song –The shawl of galway grey by Tony Small. Track, 1014, former county councillor Michael O’Neill gives an insight into ‘people politics’ in relation to the evolvement of community development in Ballinakill Parish. Track 1015, the first female chair of Galway County Council Connie Ni Fhatharta gives an insight into the female perspective.